Why Greece will benefit from joining the e-scooter movement: it is a market growth opportunity; a solution for city commuting, and environment-friendly city living; also, an economic benefit for city inhabitants’ disposable income. Why Greece will benefit from joining the e-scooter movement now that Lime & VOI are coming soon to Athens. The world is entering a new era, where the economic and political importance of Cities is growing rapidly. Today, most of the world’s population lives in cities, and urban concentration is accelerating. By 2030, 75% of the global population will inhabit metropolitan cities. Therefore, cities are vital for solving major social, environmental, and economic challenges. Ensuring that our cities are creative, connected and sustainable is a major opportunity to improve the lives of billions of people along with the health and future of the planet itself. You can get a good stimulus (download the .pdf) at the Ericsson’s City index report and a useful infographic for smart cities. Cities will improve by communities’ collaboration, digitalization and automation of public services. Smarter cities, smarter grids and intelligent transportation initiatives are the solution concepts of the near future, but very few Cities, if any, have harnessed their full potential. We need to rethink how to change existing structures to fully grasp the potential provided by Information Communication technologies. New urban planning and design in combination with groundbreaking policy development. Our cities must become more attractive, sustainable, and vibrant. To maintain the momentum of the Paris Agreement, now many US and EU cities make continuous efforts to reduce carbon emissions from the transport sector. Priority areas include new service models, technologies, integration mechanisms, policy frameworks, safety, and financing. The EcoMobility Alliance partners focus on sustainable transport. Many organizations share data, knowledge and successful examples of new mobility initiatives in cities to reduce the impact of personal motorization, improve quality of life, environment, and economy (in terms of saving costs) in relation to #2030 SDG’s. Since national and regional governments’ politicians delay the sustainable mobility progress and actions, we should aspire and wish for the progressive private sector and civil society players’ initiatives to take-off. One of these players, the new entrant, Swedish VOI introduced shared electric scooters to European cities. VOI is a Scandinavian green mobility company offering electric kick scooter sharing in partnership with cities and local communities. We believe e-scooters can play a central role in changing how people move in our cities in the future. And we want to make sure that the transformation happens the right way – through real innovative technology, open and transparent dialogue with cities and Governments and by adapting our product to local needs. Mobility: what do users want? What type of mobility do customers and users want? Users want mobility to be simple. They want to have access to the means of transport best suited to their requirements and to the context. Until recently, cars and public transport were opposing concepts. Today, bridges are being built through partnerships between car-sharing services, public transport and self-service bike sharing. For mobility players, it is therefore important to promote multi-modal transport (so that users can see, test and choose from a range of options) and to make inter-modal transport easier (combining different means of transport for the same journey). To this end, we need to go even further in increasing access to information and in developing services and infrastructure. Since teleworking or by looking for a job closer to home, users will try to reduce their commuting travel time. Shared mobility: the sharing of information and equipment is becoming more common. Not only sharing of physical means, through car-sharing and self-service transport (such as the Vélib’ and Autolib bike and car-sharing services) but also information sharing, with apps that let users inform others of the status of a transport line, an accident or works, for example. Infrastructure should enable users to change from one means of transport to another more easily. Cities made for the living – not for cars. Another solution is the Lime platform. The below video has as fun as our cities should be filled with. Travel new experiences can transport you out of your everyday routine to create memories with the ones you love. The future of electric scooters and micro-mobility in Greece. Athens city is now expanded. Athens Riviera and the Stavros Niarchos Foundation Cultural Center is at a radius of 8 km. There are more hotels on Andrea Syngrou avenue. The Airbnb is becoming more and more popular every day. The existence of measures forbidding to access the city centre (a policy called “Daktylios”). It is a way to move and get around intelligently. Consumers need to diversify their commute away from using their cars and buying taxis time. Car ownership and usage are decreasing due to economic factors and a mindset shift for the quality of living in urban areas. Athens, like every European city, should depend less on fossil fuel-driven cars. In this way, the city becomes more of a playground, it’s a desirable place to be in. Currently, 20% of car-hailing rides were less than 3km. and that 20%, dramatically slows the other 80%, further amplifying congestion and pollution. So, you see, Change and transformation will be facilitated by inspiring and innovative new players, speeding up the trends we desire and need, in order to lead an improved, sustainable, environmental-friendly city living. This post is about a new market and the opportunity, but also a stimulus for each citizen’s agenda in view of European, national, regional and municipal elections. 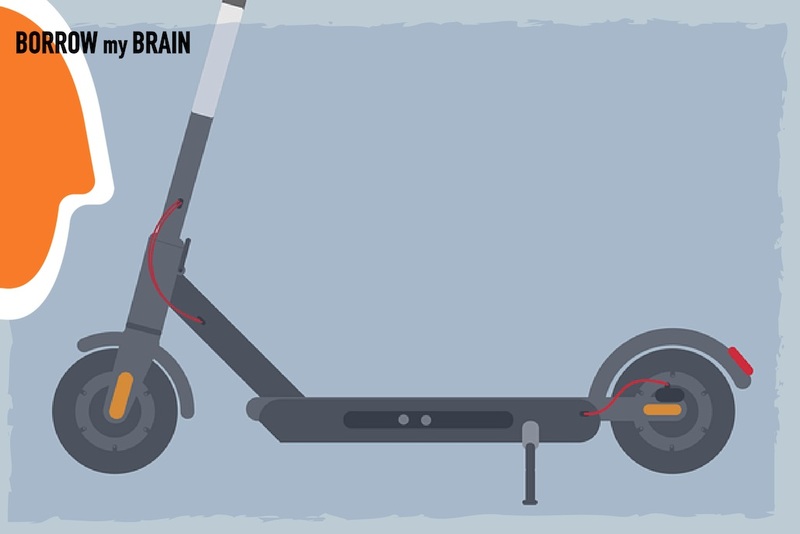 Let us know your views on the e-scooters and ‘micro-mobility’. Stefi Vasilopoulou is an Entrepreneur, Consultant, and Angel investor. The last 12 years, she has founded innovative ventures, by developing new ideas in the sectors of the Internet, Tourism & Wellness. She advises for Brand innovative strategies that blend Branding, Marketing tactics & new market opportunities.